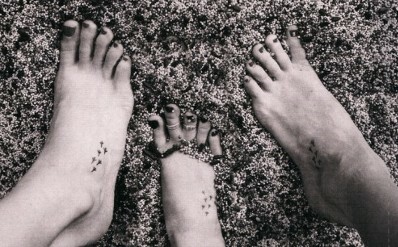 Natalie convinced Martie and Emily to get small chicken feet tattooed on their feet to mark certain career milestones. Martie thought tattoos were 'white trash'. Those milestones consist of: #1 singles, #1 albums, RIAA gold certifications and platinum certifications. So far, the Chicks have earned 22 tattoos. In an interview with Hollywood.com on May 18, 2007, Adrian Pasdar, Natalie's then husband, said the Chicks have stopped getting tattoos because otherwise, they would be covered up to their knees.